Very clean, easy accommodations and the contact person, Steven was very hospitable. We had a very good stay and would come again! When we arrived, the internet was not working, so we called. We were directed to the router and rebooting the system, and all was then fine. We appreciated the immediate response. Also, we were pleasantly surprised when we were contacted for a complimentary light cleaning half-way through our stay. So thoughtful! Thank you for a wonderful winter stay in Paris. The apartment was comfortable, close to everything we needed, filled with everything we might want or need, and felt like home for our 3-week stay. Easy to communicate; responses were quick. We loved the apartment! The location is great, the rooms are big, the beds are comfy! We loved walking to the little shops and eateries in the neighborhood. Bus stop out front was super convenient. Our family of four thoroughly enjoyed our stay. Highly recommend! Your team members were a joy to work with. Happy to help, and quick to respond. Working with our contact Krystal was wonderful. With a 9 hour time difference, I wasn't expecting quick response time to any of my questions leading up to our stay. Every time was a quick response- sometimes within the hour. I really enjoyed this apartment. Being able to relax after a long day and eat in in the evenings or our breakfast pastries every morning was great. The beds were comfortable, the place was clean, and the apartment was roomy. The bus stop right in front of the door was also a wonderful bonus, with a bit of studying it isn't hard to use the buses at all. The reservation process was so easy, and the managers were always available to answer any questions, being especially efficient and helpful. 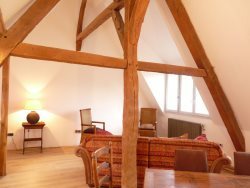 The apartment Le Mouffetard is in a great location, close to metro, bus, restaurants and food markets. I liked the authenticity of the building and neighborhood, and always felt safe and secure there. We found My France Vacation Rentals very helpful and easy to work with. Terms were laid out appropriately and in advance. The rental unit was well kept and lived up to our expectation. The employees at My France Vacation Rentals made sure that we were able to find our rental unit, and ensured we had arrived. We really appreciated all of the help associated with everyone at My France Vacation Rentals. We thought the location of the apartment was top notch. There were several restaurants and stores within immediate walking distance to the apartment. We felt we were in a safe neighborhood, appreciated being close to Luxembourg park, and found the stop on the metro very convenient. The accommodations were very comfortable. We loved having space in an apartment while being in Paris, and being able to watch the Eiffel Tower light show each evening on the hour. We found this team to be friendly, curteous and professional. This property was conveniently located to a metro but somewhat away from all the normal tourist sites so we had to allow additional time for the commute but was ok with it bc we wanted to stay somewhere with a local feel, away from tourists. It's conveniently located across the street from a bakery and very close to a supermarket. It was a great property for us as we appreciated the larger size it offers, along with all amenities. It even has a washing machine and dishwasher. My contact person was very friendly. Great stay that I would recommend to others. Wonderful apartment in a great location and with fantastic views. Property manager was always available to answer questions no matter how many I threw at him....extremely helpful. Exactly what was listed is what was there. No surprises. Perfect location, wonderful views!!!! Secure building. Every time I neded something I was answered promptly. Steven, Muriel and Michel were very friendly with us. Our stay was great and the property exceeded our expectations. I strongly recommend La Citadine! Wonderful spot, bus station right outside and metro close was a plus! Also, dining options and shopping close helped. Having a washer and dryer was excellent for a week stay. Swift response to any questions/inquiries. Super friendly. Its always makes a better vacation when you stay someplace thats seems more of a home than just a place to stay. Thats exactly how we felt about Le Lutece. All transacted via email. Worked efficiently. Good location, comfortable & warm. Will definitely recommend to others. The owner/agency provided excellent instructions, recommendations and follow up. We had a nice time staying in this Paris apartment for four nights. The owner/agency provided excellent instructions, recommendations and follow up which made locating the apartment, checking in and out very easy (very professional). The unit was just as described in the listing and the owner provided all linens and laundry detergent as well. The apartment is an easy downhill walk from the Arc de Triomphe and the neighborhood was excellent with many nice specialty stores and restaurants within a block as well as a nice little grocery store (Fanprix) around the corner. It is the perfect location for sightseeing, close to Metro and RER stations. After visiting many parts of Paris, we had more of appreciation for the family oriented area where the apartment is located as we always felt safe there. Your team was prompt with information and extremely helpful. Could not have been better. This is without a doubt one of the most fantastic vacation stays of my life. The location, the quality of the apartment, the ease of use...all were without compare. Most of all, the views from the windows! This is a dream Parisian apartment, like something from a film, for a price that makes that Parisian dream truly affordable. Thank you! Everything is super well and professionally organized. Warm and nice apartment, Parisian feeling at its finest. Everything is super well organized, even those small details that makes your staying enjoyable. As I said above, Krystyna could not have been better...efficient, extraordinarily responsive. A perfect holiday week in Paris. Wonderful location, magnificent views and a well-equipped property close to transportation and walking distance to many major attractions and neighborhoods. Good communication and instructions. Fast and friendly responses. Great! Thank you! The location was perfect - within walking distance of most museums/attractions and also close to buses, metro and RER. Lots of restaurants/cafes in the area around the apartment. Beds and bedding were very comfortable. Separate beds (bunk beds)for our two boys was an important feature for us. Also appreciated that the apartment had a supply of Kleenex, toilet paper, dish detergent,garbage bags, etc. Easy to communicate with team. Grenelle was a perfect haven while in classes in Paris. When family stayed we had plenty of room and easy access to public transportation, bakeries, food shopping , monuments , museums etc... would stay again and again !